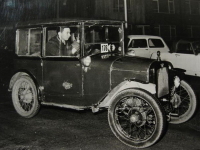 Following my inauspicious start to the Classics in a Morris 8, a few words about my next venture, the Austin Seven. 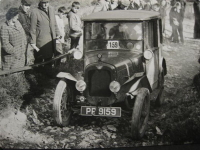 It had to be an Austin Seven, I really wanted one. 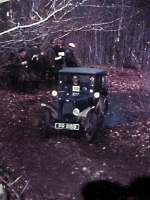 I’d seen them perform on the hills and on the way back from the MCC Lands End Trial in the Morris 8, Barry Clarke overtook us somewhere near Tedburn St Mary on the old A30. He stopped shortly afterwards and we pulled in behind him. He said that they had just packed 80 miles into the last two hours and thought a cup of coffee was called for. A 40mph average long before any dual carriageway, taking into account the Launceston and Okehampton bottlenecks would tax even a modern car so, if I had any doubts (and there weren’t any) this experience doubled my resolution to acquire a vintage Austin Seven as soon as possible. One was finally located and purchased. It was a 1927 saloon, absolutely standard down to the foot operated starter, magneto, bent wire crank and three speed box. The handbrake operated the front wheels and the foot brake, the rears. Time to join the 750 Motor Club and to speak to Michael Ware. Following his advice, I sought a later engine with a larger diameter crank but still two bearing which, I understood would be better than the even later three bearing model. Cambridge Engineering in Chiswick sold me a 750 Formula engine, which, they claimed to have been built and run by Jem Marsh but when many years later I spoke to him about it he said it couldn’t have been one of his. Anyway whether it was or not, it was beautifully worked and worth every penny I paid for it. The manifolds, Solex carburettor and Cambridge alloy cylinder head were all sourced from the 'For Sale Ads' in the 750 Club magazine. We were soon in business. I could not believe the performance, it was staggering and very exciting bearing in mind how high and narrow the car was and of course, no brakes! 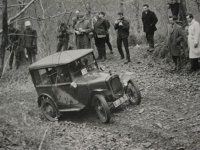 In one of his excellent articles in the club magazine, Holland Birkett described how the handling of these little cars could be transformed very simply. All you had to do was to slacken off the nuts holding the radius arms to the front axle and twist the radius arms in one direction (can’t remember which now) and then re-clamp. This had the effect of rotating the axle and thereby increasing the caster angle. What a difference to both to straight-line stability and cornering ability. And the best thing, all for zero cost! In more recent times, I’ve increased the caster on Dellows with the same amazing result. In this guise, Formula engine, three-speed box, no brakes, we embarked on the Lands End. Sadly, we could not emulate the performances of Messrs Ware, Hill and Clarke but we did do rather better than we did in the Morris. Inexperience and high gearing in equal proportions were the probable reasons for an indifferent result but, hey, there’s always next time! By the time we arrived home, there was an ominous noise coming from the transmission. This was traced to the axle end of the propshaft. I use the word propshaft in its widest sense. It was a small diameter bar with a fabric coupling at the gearbox end and a peg inserted through its diameter at the other. A rectangular block, crown on one face, was fitted to either end of the peg and the assembly inserted into a slotted housing on the rear axle. This slides back and forth with the suspension movement. The strange thing was that these blocks were only partially inserted into their housing and as a result were fairly badly chewed up. The car appeared to have stretched! At this point, the Austin Seven specialists among you will be way ahead here and will be sadly shaking their heads at my ignorance at having committed a basic error in the build. 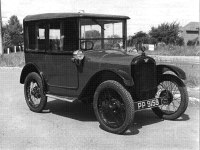 I later found out that Sir Herbert had been very clever and that the later engine and four-speed box had an identical length to the 1927 engine with the three speed box. Thus, by fitting the later engine to a three-speed box the assembly was shorter by probably an inch, which caused the trouble. The car hadn’t stretched at all! So the four-speed box would not only solve the propshaft problem but would also give a much needed shorter first gear for the likes of Bluehills2 and so transforming the car into a trials winner. By sheer luck, I was offered, free of charge, a 1933 saloon for spares. Not only did this have the desired four-speed box but also coupled brakes which would be a useful modification to my car. As I remember it the basic drawback with the brakes was that the cables attached to levers on the underside of the front axle and under braking, the axle twisted so in effect reducing the braking. This was overcome with the Bowdenex over the top of the front axle conversion which made a huge difference to the stopping power. As I remember, Michael Ware ran on second-hand motorcycle scrambles tyres which were huge and very knobbly. I think he must have been running a shorter diff which made this possible. I stuck to 3.25 x 19s but found a real gem of a tyre in the uni-directional Michelin Golden Arrow. These tyres gave extraordinary traction although I have to say that I never got up Crackington but managed to clean every other Lands End section. The night sections were a real challenge because of the poor lighting. The generator could only support one headlamp at a time so I fitted two Lucas spotlamps, one as a dip and the other as main beam. The run down the coast road from Minehead in the dark with fog was quite exciting. On the up side, the car despatched Porlock and Lynmouth hills with contemptuous ease. Although we had a number of minor breakdowns, there was never anything major causing us to retire. The most common problem was block oil jets highlighted by an increase in oil pressure. This necessitated a stop to remove the brass blanking plugs and do a bit of broddling with some fuse wire. On another occasion, all the nuts holding the block to the crankcase came loose shredding the paper gasket and allowing oil to blow around the engine bay. All part of the joy of running an Austin7! In the mid 60s, the Austin was my daily driver taking me from High Wycombe to Slough and I remember some epic journeys in the snow tackling Hedsor Hill up towards Cleveden and Burnham Beeches; all great fun. On one occasion, I tried an alternative hill and failed half way up. On the way down a chap with an outfit asked me what the hill was like. I said we’d not managed it and with that he revved the engine and was off in a shower of snow. I don’t know if he made it or not but it was certainly a spirited try. The car and I parted company in 1967 after I had restored it. 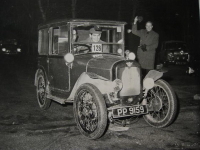 It was purchased by H.A Saunders the BMC dealership in High Wycombe and it spent a year or two in their showroom. It has changed hands a few times but as far as I know it still exists although I don’t know the current owner. I still have a soft spot for the little Austin and have great admiration for the MCC stalwarts who still campaign these cars with little or no weather protection despite getting on in years. This article, written by John Bonnett, a friend from West Devon who keeps in touch with CA7C. originally appeared in CA7C Seven Focus in Jan 2100 pp7-9. 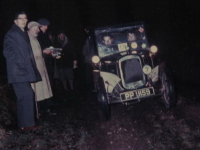 John's old Seven, PP 9159, is now owned by a member of the Bristol Austin Seven Club. From the MCC website: "The Motor Cycling Club Ltd was founded in 1901 and is one of the very oldest clubs for the sporting motorist. 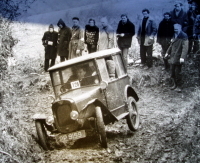 It organises three great long distance classic reliability trials - the Exeter Trial (held in early January), the Lands End Trial (held at Easter) and the Edinburgh Trial (held in early October). These have all been run since the first decade of the last century with the essential character unchanged and entries still numbered in the hundreds."